An automated blood culture system (BACTEC 9240) was used for the isolation of aerobic bacteria from the blood of septicaemic neonatal calves. Blood samples were collected from 90 clinically septicaemic and 20 healthy neonatal calves and inoculated into blood culture bottles. There were 89 significant isolates from 90 positive blood cultures using the BACTEC system. Escherichia coli was the most common pathogen detected accounting for 56 (63 %) out of 89 isolates. The other pathogens were β-haemolytic streptococci (15.7 %), Staphylococcus aureus (10.1 %), Klebsiella sp. (5.6 %) and Corynebacterium sp. (5.6 %). All isolates showed a susceptibility rate of 100 % to enrofloxacin, cefepim, cefoperazone/sulbactam, imipenem and meropenem while some of them were ranged from 75 to 91.7 % susceptible to amoxicillin/clavulanic acid, ampicillin/sulbactam, gentamicin and cephalosporins. Keywords: antimicrobial susceptibility, BACTEC blood culture, neonatal calves, septicaemia. Septicaemia is an important sequel to bacterial infection that causes a high mortality. It is most likely to be present in colostrum-deprived neonatal calves kept under poor shelter and hygienic conditions6,11. Common clinical signs of septicaemia are diarrhoea, dehydration, lethargy, hypothermia, lack of suckling reflex and recumbency in 1-7-day-old calves. Because clinical signs are nonspecific, early diagnosis of septicaemia is difficult. Rapid and reliable culture with subsequent identification of pathogens from the blood is vital so that effective antimicrobial therapy can be provided. A bacteriological culture of blood is necessary to confirm a diagnosis of septicaemia11,23. Automated blood culture systems are commonly used to identify infectious agents causing septicaemia in human medicine9,13,15. In veterinary medicine, however, conventional blood culture methods are used in neonatal calves with septicaemia7. Oxoid Signal18 and BACTEC blood culture systems3 have rarely been employed in the veterinary field. The BACTEC 9240 system is one of the new automated continuous BACTEC blood culture systems using infrared spectrophotometry to monitor CO2 production by growing bacteria with a fluorescence sensor19. This system detects blood-borne organisms rapidly and accurately. It minimises the incubation time, contamination risk and false negative rate14,21. Although it seems to be a relatively expensive method, the system may reduce the cost of treatment through early recognition of the infection that enables effective management. Antimicrobial susceptibility results for the isolates using an accurate method, such as the BACTEC 9240 system, will help to determine a suitable drug treatment programme. The purpose of the study was to detect aerobic pathogenic bacteria in the blood of septicaemic neonatal calves with the BACTEC 9240 blood culture system, and to determine the antimicrobial drug susceptibility of isolates. Blood samples were collected from 90 septicaemic and 20 healthy (control) neonatal calves aged 0-7 days. The septicaemic calves were referred to the Faculty of Veterinary Medicine's clinics of internal medicine in Erzurum in eastern Turkey. Prior to venipuncture, hair was shaved and the skin disinfected by scrubbing with 70 % ethyl alcohol and applying 10 % povidone iodine for 1 minute. An experienced veterinary clinician collected the samples following the antisepsis procedure to prevent possible bacterial contamination risk. Ten millilitres of whole blood was drawn from the jugular vein of each calf with an 18-gauge needle into a sterile disposable syringe and then infused into a blood culture bottle12. The BACTEC 9240 blood culture 'kits' each contained an aerobic blood culture bottle, a needle, a syringe and an instruction brochure (BD BACTEC Aerobic, Becton Dickinson). Isopropyl alcohol was poured on the rubber septum of the bottles for decontamination and the blood samples were inoculated directly into the bottles after exchanging the needle used for venipuncture with a new sterile needle according to the manufacturers' recommendations. Inoculated bottles were immediately transported to the medical microbiology laboratory at Ataturk University for culture. All bottles were loaded into the instrument in the computer-assigned positions and incubated for 5 days with continuous agitation. The system used infrared spectrophotometry to monitor carbon dioxide, produced by microorganisms on a continuous basis. The bottles were removed from the instrument when a signal alarm was obtained. An aliquot of the bloodbroth mixture was then aspirated aseptically using a syringe for initial Gram staining. Based on Gram-staining results, aliquots from the bottles were subcultured on 5 % sheep blood agar (Merck, Germany) and MacConkey agar (Merck, Germany) plates and incubated aerobically. Microorganisms isolated from positive cultures were identified using conventional biochemical tests20. In vitro antimicrobial susceptibility testing of 89 isolates from septicaemic calves was carried out using the disk diffusion method according to the Clinical and Laboratory Standards Institute2. Antibiotic susceptibility tests were carried out using the Kirby-Bauer disk diffusion method on Mueller-Hinton agar (Merck, Germany) plates1. Bacterial isolates were tested against the following antimicrobial drugs: cefoxitin, cefaclor, ceftazidime, ceftriaxone, cephazolin, cephalotin, cefuroxime, cefoperazone, cefotaxime, cefepim, imipenem piperacillin/tazobactam, amoxicillin/clavulanic acid, ampicillin/ sulbactam, meropenem, cefoperazone/ sulbactam, ticarcillin/clavulanic acid, enrofloxacin, and trimethoprim/sulphametaxazole (Oxoid). The antimicrobial susceptibilities were expressed as the percentage of isolates that were susceptible. The calves included in the study showed clinical signs of septicaemia, namely lack of suckling reflex, lethargy, weakness, anorexia, recumbency, hypothermia/ hyperthermia, and/or clinical shock and diarrhoea. Of these symptoms, diarrhoea, dehydration and hypothermia were the most prominent. The BACTEC system detected growth of bacteria in 89 of 90 aerobic bottles. A single organism was isolated from each sample of the septicaemic group. Escherichia coli was the most common pathogen accounting for 56 (63 %) out of 90 isolates. The other pathogens detected were 14 β-haemolytic streptococci (15.7 %), 9 Staphylococcus aureus (10.1 %), 5 Klebsiella sp. (5.6 %) and 5 Corynebacterium sp. (5.6 %) using standard procedures (Table 1). Eighty-nine blood culture bottles were positive within 3 days of incubation: 25 on day 0 (28.1 %), 45 on the 1st day (50.6 %), 14 on the 2nd (15.7 %), and 5 on the 3rd (5.6 %). The species are given in Table 2. Coagulase-negative staphylococci (CoNS), as contaminant bacteria, were isolated in only 2 of 20 samples in the control group from healthy calves. No bacteria were isolated from the remaining 18 samples. 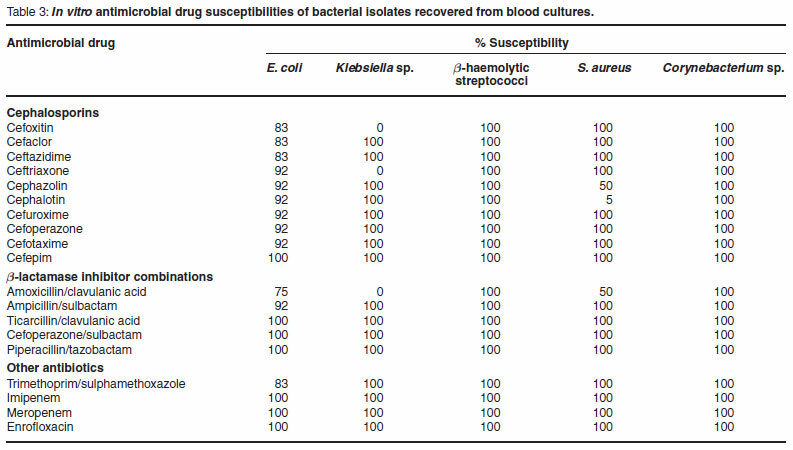 The results of antimicrobial drug susceptibilities of the bacterial isolates are shown in Table 3. β-Haemolytic streptococci and Corynebacterium sp. were found to be susceptible to all antibiotics tested. All the isolates showed a 100 % sensitivity to enrofloxacin, cefepim, cefoperazone/ sulbactam, piperacillin/tazobactam, ticarcillin/clavulanic acid, imipenem and meropenem. Susceptibility rates to other antibiotics ranged from 75 to 91.7 % to amoxicillin/clavulanic acid, trimethoprim/sulphamethoxazole, ampicillin/ sulbactam and gentamicin. Susceptibility to cephalosporins was 100 % to cefepim, 91.7 % to cephalotin, cephazolin, cefuroxime, ceftriaxone, cefoperazone and cefotaxime and 83.4 % to cefoxitin, cefaclor and ceftazidime. Bloodstream infections such as septicaemia and bacteraemia result in the death of young farm animals throughout the world, resulting in economic losses in herd production. The isolation of microorganisms directly from blood can be a guide to accurate diagnosis and effective treatment in these cases4. Rapid, automated and reliable blood culture systems have been developed and are routinely used in human medicine. Of these systems, the BACTEC system is frequently used. In human medicine it has been shown that the BACTEC 9240 automated blood culture system is more effective than conventional methods14. Its main advantages over previous generations of blood culture instruments include full automation, quicker detection of blood pathogens, and improved laboratory workflow because it is not labour-intensive17. With conventional methods, isolates needed to be checked for growth of bacteria during culturing and passaged if necessary, which is time-consuming and carries the risk of contamination. The number of passages should be restricted to increase medium reliability and method sensitivity in processing of blood cultures. The BACTEC system shakes the blood culture bottles periodically and sounds an alarm when bacterial growth is detected. This saves time and decreases the consumption of medium and the risk of contamination. Compared with conventional systems (i.e. BACTEC enrichment broth and Oxoid Signal blood culture) the BACTEC system was determined to be most sensitive and time-efficient, having a low rate of false negatives for the isolation of microorganisms in culture of blood and sterile body fluids5,22,24. In the veterinary field, conventional blood culture systems have infrequently been used in diagnosis of septicaemia in animals6,7. Oxoid Signal blood culture and BACTEC systems have also been investigated in other studies3,18. The BACTEC system is now used not just for humans, but also for cattle. It has provided a positive diagnosis of Johne's disease caused by Mycobacterium paratuberculosis in cattle and the system was found to be faster than standard methods3. Although the objective of this study was not a validation of the BACTEC system, it enabled the 9240 automated blood culture system to be evaluated as to whether it will be a practical method for the diagnosis of bacterial septicaemia in naturally affected neonatal septicaemic calves. To the authors' knowledge, this system has not previously been evaluated in neonatal calves. The calves recruited in the study were clinically diagnosed as septicaemic. Most of these calves showed apathy, lack of suckling reflex, dehydration and diarrhoea. In a previous study the authors evaluated a clinical score of calves in terms of general attitude, hydration status and appearance of scleral vessels, and found a prevalence of 31 % for bacteraemia8. Accurate identification of the pathogens in their bloodstream was necessary for confirmation of the diagnosis. The pathogenic bacteria isolated were identified as S. aureus, Streptococcus sp. and species of the Enterobacteriaceae. In this study the microorganisms isolated were regarded as pathogens owing to the severe clinical signs manifested by the septicaemic calves. Coagulase negative staphylococci (CoNS) and some Bacillus sp. occurred as contaminants24. Positive blood cultures were determined in 89 of 90 bottles obtained from the septicaemic calves. Seventy of 89 cultures showed positive results within the 1st 24 hours indicating the rapidity of this system. Septicaemia is a common clinical problem in exhausted neonatal ruminants. Rapid diagnosis and treatment of septicaemia can improve the likelihood of a successful outcome. Blood culture studies on septicaemic calves indicated that E. coli was the most common Gram-negative bacterium isolated, accounting for approximately 80 % of the bacterial isolations11,23,25. These pathogens usually enter the body by means of contamination of the intestinal tract within 24 hours of parturition, resulting in septicaemia, death or local infections such as meningitis, polyarthritis and polyserositis in a short space of time. In this study, the pathogenic species obtained were E. coli, β-haemolytic streptococci and S. aureus, in agreement with previous reports. In addition, a single organism was isolated from each of the samples from septicaemic calves. The most frequent organism cultured was E. coli (63 %) in blood cultures. Other organisms cultured were β-haemolytic streptococci, S. aureus, Klebsiella sp. and Corynebacterium sp. A previous study similarly reported that E. coli made up 51 % of isolates when blood from critically-ill neonatal calves was cultured in the conventional way7. Furthermore, E. coli and Lactococcus lactis were determined in septicaemia and septic arthritis in neonatal calves using the same method26. In Oxoid Signal blood culture systems, E. coli (65 %) and Group D streptococci (11.5 %) were isolated from the blood of septicaemic calves and foals11, while E. coli (56 %) and Actinobacillus sp. (26 %) were isolated from blood cultures in septicaemic foals18. In human septicaemia, aerobic Gram-positive cocci (particularly Staphylococcus sp.) were isolated most frequently3,13,16. The difference in isolates from humans and animals may be related to different environmental living conditions and housing. Positive blood culture results are necessary to make a definite diagnosis of septicaemia. However, septicaemia can progress quickly in neonatal calves, therefore antibiotic treatment should not be delayed until the results of blood cultures are obtained23. Antibiotic therapy currently acts as the cornerstone of treatment of septicaemic neonatal infection. Bacterial resistance to antibiotics is a common reason for a failure of treatment, so appropriate antimicrobial treatment to septicaemia is critical to decrease mortality rates7,23. Bacterial susceptibility patterns should be documented to determine whether the microorganism is indeed susceptible to the selected antibiotic. In this study, antibiotic susceptibility patterns of the isolates recovered from blood samples from septicaemic calves were evaluated. Many of the isolates tested were sensitive to cephalosporins. Of the cephalosporins tested, cefepim, cefotaxime, cefoperazone and cefuroxime were likely to be the most effective. In previous investigations, enrofloxacin has been demonstrated as effective in the treatment of E. coli-induced septicaemia in calves23. In this study, all the isolates were susceptible to enrofloxacin. However, 16.6 % of the isolates were resistant to trimethoprim/sulphamethoxazole, one of the drugs most commonly used in the Middle East (particularly eastern Turkey). Therefore E. coli antibiotic resistance in the region is not surprising. Moreover, resistance to this drug among E. coli isolates from calves has already been observed10,11. It is suggested that the success rate of antibiotic treatment can be improved by knowing the susceptibility rate. Although the BACTEC system may be a relatively expensive method (compared to classic blood culture systems), the cost can be offset by decreasing mortality rates through early diagnosis and accurate treatment. Further detailed studies could be undertaken to evaluate this system as a diagnostic tool for other diseases in the field of veterinary medicine. The isolation of pathogenic aerobic bacteria from blood has been achieved in septicaemic neonatal calves using the automated BACTEC 9240 blood culture system. The system allows for rapid detection and identification of pathogens leading to an accurate diagnosis. Once the pathogen is isolated, its susceptibility to antibiotics can be determined, ensuring more effective use of antibiotic treatment. The authors thank Prof. Ahmet Ayylldlz for giving them the opportunity to use the BACTEC 9240 automated blood culture system in the department of microbiology, Faculty of Medicine, Ataturk University, Erzurum, Turkey.